“The Voice” used the biggest opening act any show could ask for – Super Bowl XLVI – to kick-start its much-anticipated season two. Christina Aguilera, Cee Lo Green, Adam Levine, and Blake Shelton all returned with a clear new focus. Not only are they out to find talent, but Green, Aguilera and Shelton made it clear they are out to deny Team Adam back-to-back championships. To refresh your memories: Not only does "The Voice" pit singers against one another, but it also sets up a competition among their celebrity mentors. Singers who successfully pass the tryout must then choose their coach for the season. In Sunday's show, perhaps the biggest highlight was contestant Jesse Campbell, a once-homeless dad from California, who had all four judges spinning around to see who the new guy was within seconds of taking the stage to sing "A Song for You". Offered a gig with any of the coaches, he went with Team Christina. 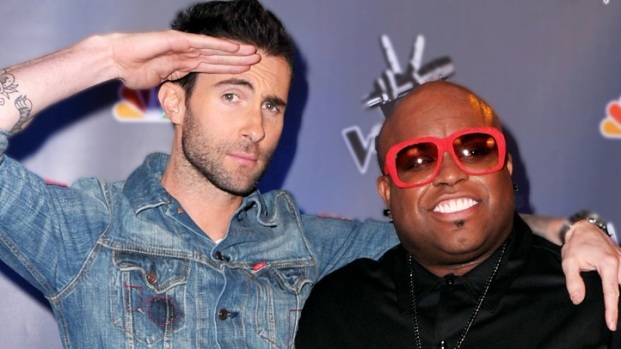 Adam Levine and Cee Lo Green talk about returning for Season 2 of "The Voice." So, how has the show changed their lives? Plus, are this season's contestants better than last seasons? Campbell didn’t just make an instant impact on the show - he was trending on Twitter by the show’s second commercial break. Later, it was husky-voiced rocker Juliet Simms brought Levine, literally, out of his seat. The Maroon 5 front man stood for her entire performance of "Oh, Darling." But his enthusiasm was no match for that of Green. “I heard the story of my life in that performance,” Green told Simms. She agreed to take the “F*** You” singer on as her coach. Despite being the defending champ, Levine went 0-3 at the start of the blind auditions, failing to convince any of the singers to take him on before Tony Lucca - a former "Mickey Mouse Club" co-star of Aguilera's - broke his scoreless streak. He also had to endure some ribbing from Aguilera, who at one point accused him of trying to be like Justin Timberlake and also called him a "used car salesman." Look out ahead, is all we can say. Going in, we know to expect an enormous boost in star power this season, with musical icons Lionel Richie, Alanis Morissette, Jewel, Kelly Clarkson, Kenneth “Babyface” Edmonds, Ne-Yo, Miranda Lambert, and Robin Thicke joining the four original coaches to shepherd a new crop of hopefuls. In its first season, “The Voice” averaged between 11 and 13 million viewers, making it one of the highest rated shows on TV. “Team Adam” member Javier Colon, a Connecticut native, took home the inaugural crown. The second part of "The Voice" auditions airs at 8 p.m. Monday -- its regular timeslot -- Feb. 6.